I used red Mills 1 to 1 as well as the flax and the applesauce for flavour I tossed in some frozen raspberries or blueberries these were so freaking good it took all my strength not to eat them all. Do you recommend using King Arthur’s flour with or without xantham gum? I find that GF flour mixes with xanthan gum hold up much better in baked goods and pancakes -otherwise you’ll have to add your own. I tried the Bisquick Gluten Free mix and it tasted like heaven. Plus i omitted the flaxseed and added flax milk because I didn’t have any flaxseed. And finally, this recipe tastes AMAZING with some homemade blueberry syrup! Just last month I went to the doctor, got some tests done, and they came back saying I had Celiac disease!! And being the baker I am, I wanted to fined really good recepice fast so i could continue doing what I love! Me and my mom stumbled across MOMables! ANd LET ME TELL YOU!! this pancake recipe was the first thing a made from this website and…… I DONT EVEN REALLY CARE IF I HAVE CELIAC DISEASES IF IT MEANS THIS IS THE KINDA STUFF I CAN EAT!! These were the best pancakes I’ve EVER eaten!! Keep up the good work!! A+ job. This is a great recipe! I love it and have made it many times! I use Bob’s Red Mill 1 to 1 Gluten Free Baking Flour and cashew milk. I found that the milk alone is enough moisture. If you add applesauce, the pancakes are a little too moist, so I removed the applesauce and thought the consistency of the pancakes turned out much better. Thanks for the heads up! I used the 1to1 as well and did not use the applesauce. They were perfect! These did not turn out for me. They were lumpy and stuck to the pan. Maybe the flour. I used arrowhead mills gluten free ap. Hi Sara, sorry these didn’t turn out for you. I’ve never had success with Arrowhead flour products. They turn out gummy or gritty depending on the recipe. Can I make this with an egg instead of flax? Also, would coconut milk work okay in this recipe? I tried this recipe this morning and was sad to see that the resulting pancakes were gummy, heavy, and had an off flavor. I used Bobs Redmill 1 to 1 flour, almond milk, and I substituted the applesauce with a flax egg, which I have successfully substituted on numerous gluten free and vegan pancake recipes with amazing results. Very dissapointed that this recipe, as I see others have stated, was gummy and unappealing. Hi Mariana, this recipe does not allow much margin for substitutions. Sorry! I made these pancakes this morning with Authentic Foods brand gluten-free multiblend flour. I forgot to add the syrup but they still came out really good and my daughter gave them a thumbs up. That is huge as she is a picky eater on top of being allergic to 7 of the top 8. Thank you for a great recipe. Hello Laura, Thanks for your recipes. If I use 1/2 tapioca + 1/2 rice flour when making these pancakes, what other dry ingredients would Ineed? Also are all baking powder’s gluten free? Hi Dorothy, I have not had success making these pancakes with a homemade gf mix. With those, you’ll need xantham gum to bind for sure but I have not been able to get the amounts right. Without it, you’ll get chewy pancakes. Used Namaste Perfect Gluten Free Flour Blend and they were too gummy; I even added more milk because the batter was still pretty thick. Namaste makes this recipe gummy. has a high % of starch. Tried this recipe this morning and LOVED IT! It was a huge hit. My uncle is not the kind to try “different” things and raved about them! This is a KEEPER! Thanks so much for sharing. BTW I used the Red’s Gluten, Wheat and Dairy Free All Purpose Flour. YUM! I doubled the batch. For flour, I used half fonio flour and half Bob’s Redmill. I substituted pulverized psylliyum husks (from the coffee grinder) for the flaxmeal, only using half the quantity. And I used Pacific oatmilk (which is pretty disgusting to drink, but works fine for cooking). Instead of apple sauce, I used a fresh Fuji apple that I finely minced in the food processor, and I subbed sugar for the maple syrup. The batter was too thin at first, but I knew that psyllium thickens with time so I let it sit for 10 minutes before cooking with it and that did the trick. (Next time I’ll wait 15.) I oiled the cast iron and as usual, the first pancake was crap. I’m guessing I didn’t get much binding capacity from the apple since it wasn’t strictly “sauce,” but the psyllium made up for it. I got 12 pancakes out of the doubled recipe. Hi Laura, thank you so much for this recipe! I have come across it a couple of years ago and have been making it religiously for my boys. I have three boys (6, 4 & 2) who are allergic to nuts, wheat, egg, dairy and shellfish. These pancakes are always a hit when we have people over for brunch, even for the people that don’t have any allergy. For the flour, I use 1/2 cup of rice flour and 1/2 cup of tapioca starch. I have tried other big label gluten-free flour mix, but they seem to take forever to cook. I never have applesauce handy and have always used half of a very ripe banana and half an avocado. I don’t know why but the avocado always makes it very fluffy. Sometimes when I leave out the avocado then the pancakes are not as fluffy. For milk, I use the canned coconut milk (Aroy-D brand). I made this exactly as described above, with King Arthur flour, applesauce (organic with berries mixed in it), and rice milk. The batter was pretty runny and the pancakes were airy but super thin. Am I doing something wrong? This is my first attempt at GF cooking. I almost think that I didn’t need as much of the rice milk. Hi Jan, I’m sorry they didn’t turn out as well for you. Two things, rice milk tends to be a bit runnier and the other, Does your flour have Xanthan gum in it? (it’s mean to be used as s binder). I’ve had good success with KAF baking flour mix with this recipe frequently. Any “milk” or dairy-free alternative will work. Whatever you use. Nut milk, rice milk, oat milk, hemp milk. So yes, they are vegan and dairy free, given you use oil and not butter to cook them. I made the pancakes and omitted the applesauce. The pancakes were gooey on the inside. The applesauce binds the batter and should not be omitted.If they were gooey they were too thick on the pan. I made these for my GFCF son who is Autistic. They taste great, but I also had the gummy texture on the inside. I would assume it’s still ok, since applesauce was used. I mean, they are cooked through. Just caught me off guard for a second thinking about them not being cooked all the way. I have used bananas as a replacement for eggs many times in baking, so maybe it could be tried here too. We don’t have to avoid gluten – only yeast and eggs. Could I use a regular all purpose flour or whole wheat flour in place of the gluten-free? Do you think I would need to alter any other ingredients as a result? Have you ever tried these in a waffle maker? Regular all-purpose flour will work 1:1. Whole-wheat flour will yield dense pancakes. Good luck! I have heard of flax seed being used in place of egg and applesauce being used in place of fat. If I want to use Egg Replacer, and dairy-free margarine, do you think I could leave out both flax and applesauce? I am sorry but I have not tested the recipe with those substitutions. Question: I made these today for the first time, and used Bob’s Red Mill Gluten Free 1:1 Baking Flour. I made the recipe exactly as stated, but they were super gummy in the middle. Fortunately, the flavor was delicious & my kids have never had a “real” pancake to compare them to, so they didn’t notice the gummy texture at all and still gobbled them up! :-) But I’d love to improve the gummy texture for my own enjoyment, and to learn more about gluten free cooking and baking. Any ideas on what I could’ve done wrong? The batter was thick, with no lumps, but easily pourable. (The King Arthur flour was 3 times the price at the grocery store as the Bob’s Red Mill, so I was hoping to stick with the Bob’s one). What typically causes the gummy-ness? Thanks for your help!! It’s super hard to find recipes for all the allergies my kids have! Michelle, can you have eggs? the gummier texture is because of the apple sauce in substitute of eggs, it bakes slightly differently than eggs. I use BRM for all my pancakes now (it’s much cheaper than KAF). I’m looking for GF and Dairy free, but I can use eggs, so how many would I use in place of the applesauce to avoid the gummy texture? would I still need the flax seed? You would use 2 eggs in this recipe and omit the flax and applesauce. I believe this is because of the xanthan gum in the Bob’s 1:1. Try another GF AP flour that does not have gum in it. Super easy and amazing! I used Pillsbury’s best gluten free all purpose flour and it worked great! I did have to use a little bit more milk, which is to be expected when using a different flour blend, so it was pourable. It was still thick but worked great. I actually make Cinnamon roll pancakes by swirling in a mixture of melted butter, brown sugar and cinnamon. My son and us parents devorered them super quick! You wouldn’t have known that these were gluten free or vegan if you weren’t told. Great recipe to make all kinds of different flavored pancakes. Thanks for the recipe! Oh and one more question. Could the weather make a difference like with fudge? I live in Louisiana and it is very humid here. It seems unlikely but possible. Natalie, I live in Louisiana. These pancakes come out perfect every time. The biggest difference is the gluten-free flour that you use. I wanted to point out to some of the people commenting with terrible results that baking requires proper measurement and gluten free requires even more specific measurements. They need to be exact by leveling off dry ingredients and so forth. With that said, this may be a dumb question but should I use cup measurements for all ingredients and scrape the top to make it level with the dry ingredients and used these same type of cups with liquids. Should I be using a measuring cup for liquids or does it matter? It seems like I remember someone telling me you have to use different ones for dry and liquid. Is this true? I used King Arthur flour and I have a very good nonstick pan so the first batch I did not use anything to grease the pan and the second time I used avocado oil. The first ones were a little more gummy than the second with the oil so I preferred the ones with oil. Regardless though they both had a good flavor and my daughter that is two loved them so that is what’s most important to me. What is your opinion on greasing the pan? Also, I just want to say that it drives me nuts when people alter a recipe (especially changing multiple ingredients) and then complain and give a bad rating. Shame on the ones that did that! I can not understand your logic for doing that. Some people’s children!! Thank you for the recipe! Hi Natalie! Yes, measuring correctly makes a big difference. The proper technique is to get flour with one spoon or measuring scoop into the flour and pouring that into the actual measuring cup. Then, using a knife or your finger, swooping off the excess. If you dip your measuring cup directly into the flour bag, the flour will be more compact and you actually get more into the recipe than you need. The gummy texture really has a lot to do with the particular gluten-free flour mix. KAF is a great one and so is Bob’s Red Mill 1:1 gluten free baking mix. They are my go-to flours. the key is to also make this recipe a few times and after a while, you’ll figure out the texture you like. 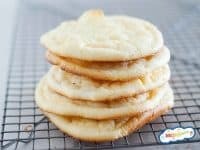 No gluten-free pancake recipe will have the “fluff” of the real thing, especially these that are dairy, egg, and gluten free. Wonderful recipe…followed as written using Bob Mills GF Flour. My husband has to make some dramatic diet changes. I found this recipe doing a web search and loved it! I’ll be taking a look at your other recipes now too! Thank you! what if i dont have flaxmeal would it still work? You’ll need to add 1 egg to the recipe. Hi, I would like to try this recipe but I am out of the US. Here, the gluten free flour is mostly comprised of cornstarch. Will that work? What do you suggest? Thanks! I have not tried your particular g-f mix but usually one that has about 30% start will work. An all-starch mix will not. The outcome will vary based on the type of gluten-free flour mix you used. Tried to make these and it was a big ‘ol fail. They were gummy, not edible. Used Bon’s Red Mill 1 to 1, Swapped syrup for coconut sugar since that’s all I had and the applesauce for pure pumpkin puree. Possible issues: over mixed? Should milk be room temperature (thinking yes but I was hungry so in it went), and they stuck to the pan. I used coconut oil so maybe it was too hot? I am sorry this did not turn out for you. This particular recipe is meant to be followed as written. That all sounds so delicious! We’re so glad these working for your family. We understand how difficult it can be to deal with allergies. Look around for more allergy-friendly recipes! How many does this recipie make???? It yields 10-12 4″ pancakes. I used the Pillsbury all-pupose gluten free flour. It was all i had. It was not fluffy. I’ll try King Arthur brand next. King Arthur is our favorite! About how many calories does each pancake have? We don’t calculate that info, but you can plug in your ingredients to https://www.caloriecount.com/cc/recipe_analysis.php to figure it out! We’re glad you liked them! You can definitely find more GF/vegan recipes here. Feel free to look around! So, Heather, you ranked a recipe (only 3 stars) based on you changing the recipe entirely? It’s people like you…. I know. I can’t prevent that things don’t turn out well when people make substitutions. All recipes always work best when followed as written. My niece came over and wanted pancakes. She has all sorts of food allergies…I made this recipe, used almond milk, cut the flaxseed meal by 1/4 and added 1 tsp almond extract. Even my children loved them!!! This is definitely going to replace our standard pancake mix. Tried this recipe with a few alterations & it was FABULOUS!! For people who think these are dense, try adding 1-2 Tb of either melted butter or oil to the batter…it helps significantly! I used Bob’s Red Mill 1:1 baking flour and subbed yogurt instead of applesauce. I didn’t have flax seed on hand & they still turned out beautifully. Be sure to flatten the batter a bit in the pancake pan too if you want thinner pancakes. YUM! Thanks for the recipe! The pancakes are delicious-a million times better than the last one I tried. I used the Bob’s Red Mill 1:1 flour, which has xanthan gum. They pancakes were just the slightest bit gummy. I looked up the King Aurthur gluten-free measure-for-measure and it also has xantham gum, but their regular gluten-free all purpose blend does not. Which one do you use? Any ideas? We use the gluten-free measure-for-measure, but I’m sure either would work. Let us know which one you try! My son LOVES these pancakes! Can’t tell you enough what a gift this is for me as he was recently diagnosed with Eosinophilic Esophagitis (EoE) and having so many food restrictions (eggs, dairy, gluten, soy) it has been a struggle to get him excited to eat much of anything… but he loves the pancakes.. and whipping them up, too! One day, one new recipe at a time…please keep your allergen free recipes coming!! These are THE BEST gluten free-egg free pancakes I have ever had. My son has ridiculously specific dietary restrictions including wheat, eggs and milk to name a few. I have tried at least 3-4 other pancake recipes and they were all terrible. This one takes the cake! I did make 2 adjustments. I used apple juice and water in place of the milk substitute (my son can’t have any of them) and I only used 1/2 the liquid (1/4 c simply apple juice and 1/4 c water). They turned out fluffy instead of gummy like all the other recipes I tried and the flavor reminds me of an apple spice pancake. Even my daughter who is not restricted loved them. We will be making these on a weekly basis!!! I’m so glad these turned out to be a great success for you Lauren! Your apple spice version sounds delicious! Wow! I just made these and they were delicious. My daughter is intolerant to wheat and eggs so I was so happy to find and try this recipe. I followed it to the letter with the exception of using cow milk and cutting the cinnamon in half. The only issue that I had was that I couldn’t make them round and had some difficulty flipping them – though this could be down to my lack of overall pancake experience. Thank you, it’s a keeper!! I like to use an ice cream scoop or melon baller to help make them the same size and round. I have also used a squeeze bottle in the past. Hope these help you in getting nice round pancakes. Of course, I do make pancakes often, it’s a house favorite. Can I use coconut flour instead of gluten free all purpose flour? I guess I can try it out myself if no one has tried it before. Thanks! Coconut flour is not a 1:1 replacement for all-purpose flour. These pancakes were not designed to be made with coconut flour. I have been making pancakes (or hotcakes, as I was raised to call them) since the 70s. 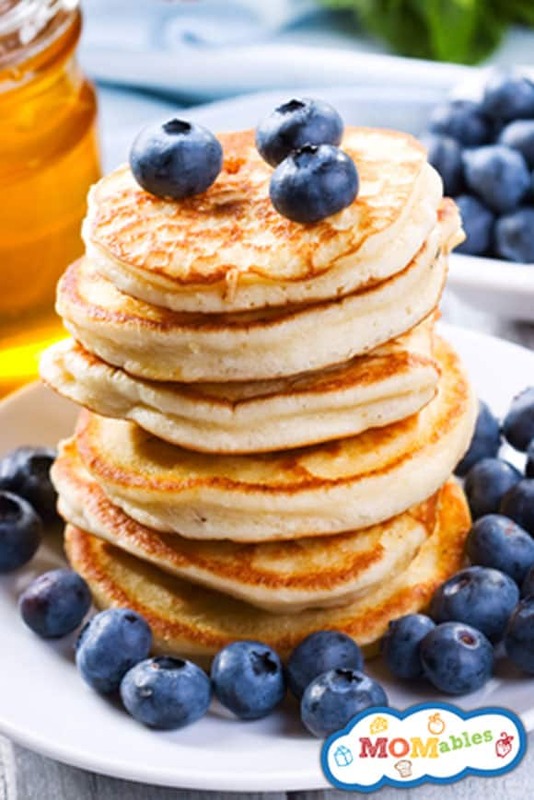 Recently I had to change to a full on vegan diet (health reasons) so have been searching high and low for recipes to replace – vegan style – as many of my (and my family’s) favorite dishes as possible…Hotcakes being one of them. I made this for the first time this morning. It was tasty but the texture was a bit much. I will cut the flax meal back by half next time and continue to cut it back until my children love it. The recipe as it is makes pretty thick hotcakes, and they are quite dense. This makes it difficult to pan fry to done-ness without getting them too crispy (by that I mean burned) so need to add roughly 1/2 cup more liquid for the proper cooking – depending on the type of flour used. If you are expecting them to be “fluffy” looking as in the picture, please try not to be disappointed. They will also be darker (thanks to the flax seed meal) and not appear fluffy at all. I am one who lives to make PRETTY food. Everything I make, from snacks to full meals, is pleasing to look at before my family digs in. Food goes down easier and happily when it is something can be eaten with your eyes first !!! Thank you for trying the recipe. It’s unfortunate that it didn’t turn out the way you hoped. Part of the train is because when you cut out some of the flax, the sponginess (fluff) is also removed. The flax is here to replace the egg and if you are looking for golden colored pancakes you can use golden flax as the ones pictured did. There are a lot of variables that will make this recipe not turn out as pictured; and besides the flax, the type of gluten free flour used will make a difference as well. I hope you decide to try them again as written. Fortunately, the flax, as you may already know, is not required at all, as a binder, as the apple sauce takes the place of the egg all by itself. I have been experimenting with different types of gluten free flour so the jury is still out on my favorite one for hotcakes. A single one, as with all other types of flour, is not meant for every recipe, unfortunately. Oh if it were that easy. I understand your frustration but in this particular recipe, the apple sauce + flax create a firmer bind. the apple sauce alone won’t fully bind. 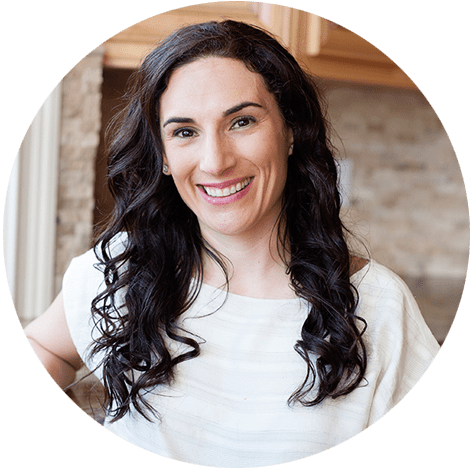 Omitting ingredients and then creating your own modification and not being happy with the results isn’t fair to those of us that develop recipes. These are tested dozens of times (at least on our website) with a specific measurement of ingredients. This particular recipe isn’t kind to experimentation and works best with 1:1 gluten-free flours like from Bob’s Red Mill and King Arthur flour where the protein to starch ratio is close. what flour are you using for this recipe? Too gummy. :( Used 1-to-1 flour. What brand? We’ve had the most success with King Arthur! Hey there! I am going to try these tomorrow….does anyone know if you can make the batter in advance and refridgerate? I appreciate your working putting this together! My 14 month old has allergies we can’t quite 100% put our finger on yet so we are gluten, dairy, egg, free….SIGH! Thanks again! I think that could definitely work! Let us know if you try it. I’m in the same boat! I have a 15 month old daughter! Yeah, I totally understand. I’m 15 and was recently diagnosed with EOE. It’s similar to an allergy and we don’t yet know what causes it so for 3 months i’m off of wheat, egg, soy, peanuts, tree nuts, dairy, fish, and shellfish. this recipe is super helpful. We are new to the gluten free, egg free, and peanut free world – 2 year old son has all of these allergies. I just wanted to say that of all of the pancake recipe’s out there, this one takes the cake!! Writing this one inside the cupboard door! So happy to hear that!! I know how hard it can be to juggle food allergies. Look around our site for more allergy-friendly recipes! I agree, also being new to a gluten intolerance I have not had much luck with some recipes. This one was awesome! Delicious , I was so excited when I saw how well they turned out and theres no added fat ;) Thank you! These are good. I’ve tried a few different flours and like both the King Arthur and bobs 1-1 flour best. Because we’re not dairy free, Ive tried yogurt in place of the applesauce with success and get extra protein boost. So I alternate between applesauce, which taste more like fritters to me when I use that and Greek yogurt. We add enjoy life chips too, and less cinnamon. It’s hard to find a gf, ef pancake recipe that is fluffy. I’m glad you got this recipe to work for you. I love those chocolate chips! So good! My 2 year old asks for them every morning and my husband even requests this recipe every weekend. Kinda tastes like apple pie to us. It does come out thick so I add a little water or more milk and heat at a low temperature and cover. It takes a while so you definitely need time doing this way.I prefer the batter to be thick ( it’s more filling and has more flavor. I let it brown on one side and once it is golden and crispy. I notice this thick batter once browned can be flipped and mushed down like a pancake. I flip it over and cover it again so that the cake is evenly cooked. I use coconut oil so by the time I flip the pancake it is really hot and smoking if i’m not keeping an eye on it. I turn of the burner soon after the cake has been flipped…then let it cook in it’s own heat (covered). I’m glad you got it to work out for you! The final mix comes out more like cookie dough – I followed all the instructions – what did I do wrong? The brand of flour definitely makes a difference. I’d slowly add milk until it’s the consistency of pancake batter! I am looking for a dairy and egg-free but not gluten-free pancake mix. Just wondering how these would be with just regular all-purpose flour and if anyone has tried them that way?? I think they would definitely work, but you may need to adjust the amount of milk to get the right consistency. Let us know how they turn out! very disappointed – followed directions and the batter came out real thick – to get the right consistence I had to add a ton more milk. The pancake browned on both sides but was real muchy on the inside – couldn’t eat them. Would be nice to find a pancake that really works and looks like the picture. Liked the idea it was vegan and gluten free. Used Arrowhead Mills Gluten Free All Purpose Baking Mix, Bob’s Red Mill Golden Flaxsee Meal, goats milk. Any problem in using these items? Hi Rose, I am sorry these didn’t turn out for you. The issue in this recipe is Arrowhead Mills flour. It’s very dry, best for cookies and baking. You will have to use a lot more liquid. Their main ingredient is rice flour and also has rice bran. Sorry! If you want to use Arrowhead mills flours (not my favorite) they have a pancake mix specifically designed for gluten free pancakes, it’s higher on starch (it has both potato and tapioca) I hope this helps. I am not getting the same success as others are. We just got home from picking up some maple syrup at a farm so my 3 year old requested pancakes for lunch. New to a DF/GF diet, I just Googled to find a quick recipe. 1st I will use only 1/4 the cinnamon next time and maybe a punch more sugar. The texture feels gummy to me, and kind of grain-y . I will try grinding the Flax more finely next time and stirring the batter less. I want to give them another shot, but 1st time wasn’t a hit with the kids. I’m sorry to hear that! Those changes sound fine. Also, all gluten-free flour blends are different, so the pancakes could vary depending on which brand you use. I recommend browsing our website for other allergy-friendly recipes! The pictured pancakes cannot have had cinnamon in them, as two teaspoons make this mix very brown, and are too much. One teaspoon of cinnamon is enough for one cup of flour. Otherwise, they turned out well. You can use whatever you prefer. Glad you liked them! These are by far my favorite pancakes! Every time I make them for people they are ever joyed-vegan or non vegan-! I add banana to mine and they are so good! Thank you so much. I’m so happy that everyone loves them! We love honey in our house, but everyone’s preferences are different! Thanks! What? Toxic? I have never heard this can you explain? Cant thank you enough for this recipe. As a newbie to the allergy life, ive been on a mission to make a vegan gluten free pancake for my 18 month old. Ive tried at least 6 reciped…..all failures. Your recipe saved the day!!!! Bought your flour and it came out perfect! Can you please recommend how to best incorporate banana into the pancake? I’m so happy to hear that, Natalie! I love helping families with allergy needs. You could try replacing the 1/4 cup applesauce with 1/4 cup mashed banana. Let us know if you try it! Hi Natalie! Is there a good substitute for applesauce and banana? My daughter can’t have either of these. Thanks! You could try really any pureed fruit. Sweet potato might work. Maybe even dairy-free yogurt! Thanks Natalie! I will let you know how it goes. I’ve made these several times and they are delicious, however, mine look absolutely nothing like the photo. I use coconut milk and Bob’s Red Mill GF flour blend. Mine come out extremely thin. No rise, and are a bit gummy in texture. What brands do you use? We love this King Arthur Gluten Free Flour! It must be something with Bob’s Red Mill GF flour. I used it too and they was absolutely no rise. Luckily, my kids didn’t mind. Bob’s main ingredient is chickpea flour, which has very different properties than the rice flour that’s the main ingredient for King Arthur. It may be worth noting in the recipe that this won’t work properly with just any all purpose GF flour blend. I made these using Pillsbury gluten free flour blend and almond milk and they were delicious! Will be making these from now on! So glad you liked them, Jennifer! Hi there – my little 4 year old is also sensitive to wheat and dairy. He too is VERY fussy when it comes to food. I think he is so cautious of anything he eats cause it causes such bad tummy aches. What I do is make up a large batch of pancakes – cook them – and then freeze them flat on cookie sheets. Then if he needs a quick night snack (usually because he refused to eat his supper) I warm up one or two of these in a dry frying pan on my stove on low heat with a lid on it. Then cut up the pancake with a pair of scissors and put a bit of Agave Nectar (not the syrup) in a dish for his “dip-dip” He’s happy and I know he’s not going to bed hungry. This recipe was not designed to use oat flour. You need the starch in gluten-free flour mixes. We love this Bob’s Red Mill Gluten Free All Purpose Flour. thank you for this recipe and your help. peace be upon you. I am looking forward to trying this recipe, how do think they’ll turn out if I leave out the seed flour, flax? I have people in my family who are on the AIP Paleo diet and they can’t have seeds or nuts. Thanks!! Hi! The flax is meant to substitute eggs, so you can try 1/4 cup applesauce or mashed banana or 1 tablespoon tapioca starch with 1/4 cup water (let it sit). You can also Google “egg substitutes for pancakes” and find more options based on your dietary preferences. Hope you find something that works! This is the BEST gluten free pancake mix I have ever tried. I am not a big pancake person but I really like these. I subbed an egg for the applesauce. They were fluffy and light and really good. Love the cinnamon in it too. I used the robin hood nutri blend flour. Gotta try em! I am allergic to tapioca and both King Arthur and Bob’s Red Mill gluten free flours have tapioca in them. Any suggestions for mixing my own flours that would be something similar to either of these brands? Thanks! Mel, I’d look for a mix recipe that has another starch instead of tapioca (potato or corn if you can tolerate it). I ground oats to make the flour and it turned out really good! Awesome! I’m so happy you enjoyed these. I just made these a few mins ago. They are AMAZING. I don’t have any syrup though haha. I had all the ingredients to make these luckily. I actually had a dream last night where I ate some and I knew I had to make some today. Thank you and much love! Haha, a dream about pancakes is always a good dream! I’m so happy you enjoyed them, Jonathan! Made these this morning and loved them. I used Robin Hood Nutriblend flour (which I generally find a bit dry – I usually make my own gluten free blend from Buckwheat, Sorghum and Teff). I added some 1 scoop of vanilla protein powder + additional allspice and nutmeg and topped them with a mix of greek yogurt and raspberries. They were really delicious! What are the ratios of flour in your blend of buckwheat, sorghum and teff? We use the Bob’s Red Mill All Purpose Gluten Free Flour and King Arthur’s Multipurpose Gluten Free Flour! Thank you for making my Christmas… I made these for my husband who is just like a big kid and he loved them. I was so happy not to give up our Christmas tradition of Pancakes on Boxing day. Thanks! these were by far the best Christmas gift ever. It’s the small thing in life! I’m so happy you could continue the tradition! No one should have to sit out because of an allergy. Thanks, Margie! I made this recipe for my allergy free son, and decided to give some to my daughters as well. ALL of my kids loved it! My son licked his plate, he never licks his plate! He wanted waffles and we were out so I used this recipe instead for pancakes! He wants me to make more lol. Thanks for posting this. I’m so excited this was a full family favorite! I know the great feeling when you find one recipe that works for everyone. yay! I tried this and they tasted great. Just harder to cook than normal pancakes. They stuck to my pan and we’re hard to flip. Any suggestions. They were ugly but my son loved them. It might be your gluten free mix, they are not all created equal. Please see the recommendations on the post. Also, you might need to grease your pan a little more, again, some mixes absorb more than others and stick. I’m glad your son loved them. Mine did too. I use a tiny bit of coconut oil in the pan , and I add 2 tbsp of coconut oil to the batter, makes a tender pancake and flippable. I’m also looking for a easy, go-to recipe for pancakes! Thank you for sharing this recipe. However, mine turned out really gummy as well. I used Pamela’s GF Artisan flour blend. Is this probably why? April, all gf flour blends are different so it will be trial and error. If you use Pamela’s again, reduce the flour by 2 teaspoons and see if that helps a little. Enjoy! Thank you so much for this recipe! I think I’ve tried every GF Vegan pancake out there and this is the ONLY one that I can ever get to work — and it’s delicious! My picky 4 year old loves it and so does the hubby. So thankful we can have pancakes again!! I’ve tried Bob’s Red Mill flour and it works okay, but the King Arthur definitely is the best for this recipe. so glad this worked out great! For sure KAF all the way. Here is the freezing method and details: https://www.momables.com/how-to-freeze-pancakes/ Enjoy! Thank you for sharing this recipe. I did some ingredient replacing due to a few other allergies and the batter was very thin. The pancakes came out delicious, but I’d love to get them a little fluffier. Any input would be appreciated. Michelle, I have not tried the recipe with your combination but due to the fact that quinoa flour and brown rice flour are pretty heavy flours, you will need more baking powder. This mix will also not work exactly like an all-purpose gf flour, so you might have to add a bit more/less liquid to adjust. flour? Do you know what the measurements would be if it is possible? Hi, I have not tested this recipe with almond flour. sorry! Thanks for the great advice, Emily! I am on a mission to find a recipe for gluten-free/ vegan pancakes that actually works. These came out beautifully!!! The only substitution I used was mashed banana for the applesauce. I also added blueberries. SOO happy that when my family requests pancakes on the weekends, I don’t have to serve a crumble pile, or make them with eggs and not get any. ps- I think another thing I owe to my success this round was making sure my pan was hot before putting the batter in! I read that’s important, and it helped! It is! the pan should be preheated. So glad you found our recipe! I am new to GF. I tried to make this recipe with Robin Hood GF flour. They were gummy and gritty and brown. No fluff whatsoever. Im going to try another flour next time! their flour is mostly rice flour and the sugar beet fiber is going to make it gummy. I recommend King Arthur flour brand. enjoy! I use the king Arthur blend and they come out perfect every time. Thank you for sharing these delicious pancakes! My son loves them! I made these with organic gf all purpose flour. I loved it and my daughter loved it. Thank you. Can I use also brown rice flour and if so would it be the same measurement? Linda, 100% brown rice flour might yield chewy pancakes. AP GF flour has about 1/3 of it as a starch (typically corn/potato/tapioca) that is what yields the fluff. Oh and like I mentioned in another reply, we use pear sauce instead of apples. It was yummy!! I’m new to the whole gluten free world and to complicate matters, we cannot have rice, potato starch, oats, or coconut, which rules out all of the packaged mixes. So, I attempted to make my own flour blend of tapioca starch, sorghum, and almond meal, which was not successful as my pancakes were dense and too moist in the middle. However, my 6-year old twin boys both told me how good the pancakes tasted (bless their little hearts), so I know the recipe yields very tasty pancakes, but my flour blend is causing the problems. Does anyone have any suggestions (or can point me to a helpful website) for a flour blend that can accommodate our dietary needs? Any assistance will be greatly appreciated!! Melissa, what you need are paleo pancakes. Check these out. Use regular milk instead of coconut milk. enjoy! Thank you for this recipe! I subbed the flax for 1 egg and then my computer died so I couldn’t see the rest of the recipe (and in a crunch before school) guessed that it was 1/2 cup of applesauce and it still turned out great! We used raw milk with ours and half raw honey, half maple syrup. Just down to what’s left in the house before a trip to the grocery. I topped these with another thin spread of raw honey and all 4 of my kids loved them!! (ages 6, 5, 3, and 15 months). I used Gluten Free Cafe’s all purpose mix. My son cannot have apples. Is there anything you can sub for the applesauce? Thx! Pumpkin puree would work. Enjoy! My daughter is very picky, today I made this recipe and she ask for more! Oh, I’m a happy gluten free to be mom. Thank you Laura & team. So glad this was a winner Julieta! I’m eating these as I type this, so good!! I used 1/2 cup millet and 1/2 cup sorghum flour and used agave instead of maple syrup. They were perfect, no gooeyness in the middle and some of them I even added chopped macadamia nuts before flipping. I used coconut oil in the pan and it gave them a hint of coconut! We have been making these for a while and enjoy them. However, they have been gooey in the middle. Tonight I read through the comments before making them and have switched out Namaste GF blend for King Arthur and what a huge difference. So glad I took the time to read through (and admit that I should have just taken your advice in the first place). Thanks for a yummy recipe. I’m so glad you made the switch and it worked! the blend makes a huge difference. enjoy! As mentioned above. this recipe works best with non stick pans. glad you thought they were tasty! I was looking for a recipe using King Arthur gluten free multipurpose flour and found this one. I am not Vegan, so I did use organic butter to cook them. The only things I changed were, I left out the flaxseed (had mine too long) replaced that with 1 tbsp of ground walnuts, used 1 tsp cinnamon, 2 tbsp of honey and sprinkled frozen wild blueberries on top of the pancakes and then flipped them when they started to bubble. I had my stainless steel pan set at medium heat. They turned out great! They were a little chewy, but good that way. Everyone needs to understand that the consistency will be different than the standard pancakes. Thank you! Best gluten-free, vegan pancake recipe I have seen thus far! Super easy and quite tasty. I like the idea of adding a little liquid sweetener to the mix, I used black strap molasses and it was quite tasty! Thanks for sharing your recipe! First time gfcf here and a bit intimidated with all the recipes. Made these this morning and they were so easy and delicious!!! Thank you so much for posting the recipe!!! Glad you enjoyed them Trish! I have tried many GF, egg free pancake recipes that promised fluffy, yummy pancakes. This is the FIRST one that delivered on the promise! I am so excited! I’m thrilled you enjoyed them Lisa! so glad you loved these Sally! First time I’ve made a gluten, egg and dairy free pancake (used coconut milk) and they are pretty good except they aren’t exactly fluffy in the middle…kind of gummy. Used Bob Mills GF with Xantham gum. Wondering if that is what they are supposed to be like or was it because I used coconut milk? Will try these on my 5 year old (added mini choc chips) and as long as he approves, I’m good. He can’t have eggs, milk or wheat but wants pancakes everyday. So any tips would be helpful. Thanks! Mine were gummy inside, like not cooked in middle but brown on outside. Seems that much cinnamon turned them brown. I used namaste’s perfect gluten free flour. Also, I had a thick batter and had to add more almond milk. I always find that gluten free recipes vary by the flour used. the comment above were perfect. I have the same problem with Namaste gf flour. It’s from the arrowroot. Arrowroot is very nutritious but it tends to made things gummy when I bake with it. SunFlour Mills has a great gf flour mix that is not organic but it’s non-gmo and it works great with the gf,df, ef recipes I’ve tried! You are right Carrie. I just made muffins this morning with a mix that has arrowroot and they came out gummy. thanks for pointing it out! This was great!! I halved the recipe and put it in my waffle iron. It turned out beautifully. Great to have waffles again! We’ve had these twice in the past week and the boyfriend (who is not gluten free) raves and says they are the best pancakes he’s ever had. I can’t wait to make a large batch on my next day off so I can pack some for work. Mine got stuck in my stainless pan at first, so I added extra milk and an egg and they were perfect! Made these tonight for a naughty dinner. I had the flaxseed, but as my daughter does have anaphylaxis, eoe and cd I didn’t want to try something new at night, so I used 1 tbs of quinoa flakes. Then I opted for the maple syrup and rice milk. I didn’t see the note about the extra 2 tbs flour at first and it was a bit difficult for the first couple, then I added 2 more tbs flour and all was good. Yum! and best eaten when almost completely cooled. I don’t know what went wrong with mine but they were flat & chewy. Not what I was hoping for. oh no! what flour mix did you use? any substitutions? why is the title so misleading?! if they were vegan why the heck is there milk?!?!?!?! I don’t know what all the fuss is all about. It clearly states dairy or non dairy milk. I make these with almond milk all the time since my son can’t have dairy. We have multiple severe and complicated food allergies. We are unable to use binders, baking powders or multiple flours. I used 100% brown rice flour and instead of baking powder(due to allergy) 1 tsp baking soda mixed with 1tsp apple cider vinegar. I also forgot to add the apple sauce and these still came out perfect. I can’t wait to try them without the cinnamon too. Yum! Thank you! I tried these today. They were yum! I didn’t have applesauce so I subbed coconut oil and voila! Fab pancakes. Thanks. These were awesome! I followed the recipe and made half with blueberries and have with Enjoy Life chocolate chips. My 2 boys and husband all loved them! Will be making more this weekend! These pancakes were delicious, but my batter was too thick. Is it best to just keep adding milk or applesauce until the batter reaches the desired consistency? the thickness will vary depending on the all purpose flour you use. I wouldn’t go overboard on the liquid. perhaps an extra tablespoon next time. Glad you loved them! Followed the recipe and my both my kids and my niece LOVED them! My son is super picky, so we didn’t even tell him they were healthy til he was done!!! These are so goood! They’re kinda stretchy. When I first put them on the pan, I was skeptical, but they turned out great! great idea on the cinnamon raisin! Thank you for the recipe! I’m definitely bookmarking it. Do most people have ground flax in their GF kitchens? Because I got diagnosed just 7 months ago. No matter, I didn’t need it and the results were DELISH. I used whatever GF flour I had which was the Bob’s Red mill (w/o the Xanthan gum he recommends on the label for “All Purpose” substitutions. In fact, I had a chuckle making your recipe because it wasn’t until afterwards that I thought “Hey, this has no eggs in it!” Kinda made me laugh. And the light flavor of cinnamon apple was great. Also with the baking soda, they were very very FLUFFY which is a nice surprise. Which I don’t get a lot with my GF cooking. No one complained either (damn right, if I have to cook GF for myself this house will eat what I make!) Some of the other things I’ve made are too gummy and so rubbery it’s like a ton of resistance when you chomp down. Thrilled you enjoyed the recipe! It means ground flax. Thanks for pointing it out, I’ve revised the recipe. I just made these for breakfast with Bob’s Red Mill GF All Purpose Baking Flour. They turned out really well. I did use a non-stick pan and canola oil, and a very thin spatula, and did not have problems with sticking. Thanks!! So happy right now after no eating hotcakes for so long!!! They were great, the only difference i did was not putting applesauce and putting an egg instead. So not vegan but it held together well and didn’t stick either. I also added some chocolate chips to be extra naughty!! I make my own GF flour mix, 25% Oat bran flour 25% Brown rice flour and 50% tapioca starch. When I first bit into it, I thought it was the best pancake I’ve ever had. I added about a 1 tsp of apple cider vinegar to 1-2 portions of the mix because I like buttermilk type pancakes, it turned out fine. Thanks to someone’s tip, I subbed 3 tsp oil for the applesauce, as I didn’t have applesauce on hand. Also heated up a little oil and salt before putting the batter in the pan. I’m not used to making pancakes since I’ve been wheat-free, and I’m glad I tried this easy recipe! Awesome! enjoy for a long time to come! Loved these! I woke up one morning and my son wanted pancakes, so I was looking for a recipe that I could use what we had on hand… I mixed my own flour (1/3 brown rice, soy and potato flour) and used a can of coconut milk because I forgot to go shopping. I was out of apple sauce so I threw in about a tablespoon of coconut oil… but they came out great! I’ll be making them again even when I do have other ingredients! Loved them! Great taste, easy directions! Worst pancakes I have ever made. They stuck to the pan way too much and it was practically imposible to get to that “happy medium” for the batter. I would not recomende these to anyone. sorry they didn’t work for you. Sadly these stuck to the pan as well. I used enough oil on the heated pan :( I wonder what can be done to prevent them from sticking? Ours don’t stick on our non-stick griddle or pans. The pan might of been too hot. I used 1/2 rice flour and1/2 coconut flour, besides that didn’t change a thing. Was very thick. I had to pat it into patties using my hands. Didn’t stay together when flipping. Then I tried adding an egg and a bit more milk(dairy free). Little better. Tasted good but didn’t look like the photo at all. This was my first time using coconut flour….could that be the problem? 1/2 rice flour + 1/2 coconut flour is not a substitute for an all purpose baking flour mix for this recipe. Coconut flour absorbs 3-4 times more liquid than standard gluten free flours and should not be substituted in recipes. Coconut flour has very specific measurements for recipes… I’m sorry they didn’t turn out well! All purpose flours are typically made of 2 parts grain 1 part starch. You’ll love them next time! I added eggs back into mine…therefore I added 1/2 c more flour, 1 tsp more baking powder, 1 tbsp syrup, more apple sauce and 1 tsp of vanilla. Turned out great!! THANK YOU!! mine also stuck to the pan really bad, and I even tried coconut oil & a low temp.. how do yours not stick??? I typically use a griddle since I’m making pancakes for so many. It’s non stick. I set it to 300. But on the stove, it’s over medium-low heat on my non stick pan. They come off fine… I’m so sorry! This pancakes tasted so goood!!!!! I’m new to the GF world and since I don’t know much, I had a hard time flipping the pancakes, they sticked completely to the pan, I did make sure the pan were hot enough, enough oil.. but every time.. I had the same problem.. what did I do wrong? I used regular pan spray and coconut oil, none work for me :( . for flour I used GF Bobs Red mill all purpose flour..
We used the “Gluten Free Pantry All Purpose Flour” and they turned out delicious!! The kids loved them. We found the recipe because I had run out of eggs and needed an eggless recipe this morning. Thanks for posting it!! I know that a lot of GF recipes calls for xanthan gum…sows king arthra gf flour already have xanthan gum.in it? I use bob red mill gf all purpose flour and it doesn’t have xanthan gum. If your mix doesn’t have Xanthan gum, you are going to have to add it. I dont know about your blend Maria. I would start at 1/4 teaspoon. it will vary by mix. My blend is 70/30. I mix 70% whole grain (millet, sorghum, brown rice etc) whatever I have on hand and 30% starch (potato, tapioca, glutinous rice). I just made these and the husband loved the flavor but they were pretty gummy inside. I didn’t add any xanthan. I will next time and hope that helps. Thanks for all your recipes and tips. Maria, if they were gummy inside reduce the liquid a bit next time. Not all mixes are the same. Xatham will help bind the ingredients as well. Ok. I followed this recipe exactly and I am new to this all gluten free dairy free concept…but my pancakes are extremely gummy on the inside as if they aren’t done…I can barely cut them with a knife. I used Baking Co. Gluten free all purpose flour. Where am I going wrong here?? I’m sorry Kelly, I am not familiar with that blend. My favorites are Better Batter, Cup4Cup, Pamelas Blend, and King Arthur Flour. I had same issue. I cooked at lower temp for a little longer. Plus I think it’s pretty thick so I added a couple tablespoons of applesauce and extra milk. This is the best gluten free pancake recipe I’ve found by far. Beats the box pancake mixes that are gluten free as I don’t feel they are worth buying! I’m changing cinnamon to pumpkin pie spice because I love pumpkin pancakes! I bet these work great in the waffle maker, might help with cooking issues. Jaque, for the waffle maker, add 2-3 tablespoons extra milk. you want the mixture to be a bit runnier than pancakes. I have been using your recipe for a while now. My husband and I love it! Thank you for sharing! Can you use almond flour instead? I need something wheat free and gluten free. Tiffany, you can’t. this isn’t a grain free pancake recipe. I made these into pumpkin pie and nog pancakes for the holidays. I subbed pumpkin pie spice for the cinnamon, pumpkin for the apple sauce and coconut nog for the milk. They are delicious!! Thanks for the recipe! So yummy, just made them! I used a banana as my binder since I was out of flax so they were a little sticky but still so good and my 3 yr old loved them. Thanks for the recipe! Theses do not come out looking like the picture. They are more on the brown side than yellow. They will only be yellow if using a non GF flour. I assure you that in both pictures the pancakes were gf. We also used golden flax. Can u please tell me what brand of flour u used? I used the new Robin Hood GF flour. Also didn’t use golden flax, but not sure that would change the colour. I use King Arthur Gluten Free Flours for nearly all my gluten free recipes. I’ve found that it bakes with the best consistency. the darker flax will make them brown. golden flax is much lighter (light yellow) when ground. I used king Arthur flour too and this came out great. Is it possible to use buckwheat or rice flour? for this recipe you cannot use buckwheat as it’s too heavy. and 100% rice will not turn out good. sorry! These were great! My kids loved them. Can I store these room temp for a couple days? If I put them in the freezer how do you warm them up especially for kids lunch? I baked them in mini muffin tins. I store them in the fridge once cooled (although I am sure overnight in the counter will be fine). To freeze, line a baking sheet with wax/parchment paper, lay them flat, freeze for about an hour and then transfer to a zip bag. To use for lunch, thaw overnight in the fridge and toast in the morning. What else is packed for lunch in the bento box pictured? Looking forward to trying this recipe! Blackberries and turkey rolled up. the flax in this recipe is to substitute egg. I thought the applesauce was for the egg. I just use mashed banana (when I have them) instead of eggs. I imagine you could just omit the flax. I think it’s just there for nutritional benefits. We’ve made these several times and just omitted the flax since we didn’t have any. We used King Author’s Flour (which doesn’t have any gums) and we didn’t add an extra binder. They’ve turned out wonderfully every time! can he have ground chia seeds? it worked great for me. Ground Chia seeds act just like flax. I’m looking forward to trying this recipe. Thank you! Thank you for all of the wonderful df/gf ideas for my sons!! What a blessing! Do you have a favorite gf flour blend that you make up or purchase for your pancakes, muffins, etc.? You can’t go wrong with Bob’s Red Mill or King Arthur Flour. Ok I have tried different flour mixes with the last one being bob Mills. I’m using coconut milk and pear sauce as substitutes but the pancakes are coming out gooey in the center. Any suggestions? cut back in the amount of pear sauce. It has a higher water content than apple sauce (or add an extra teaspoon or two of flour). Also, spread them out thinner, this should work. You can also use chia seeds for egg substitute. I forgot to add Pamelas’s blend and Cup4Cup. they are my new go-to blends. If you have a costco, pamela’s is available there!